Gel stains are a great addition to your wood finishing arsenal. They shouldn't be your only choice, or even your first choice, but they should always be in the mix for consideration. Wipe-on stains are the first choice for most finishers, and in the last few years none more so than the gel versions. Marketed as one-step, foolproof stain that need only a rag as an applicator, gel stains appeal to a wide variety of finishers and woodworkers. While many serious finishers at first shunned gel stains at first assuming they were more for the DIY community, a large percentage of them have come to understand the benefits and qualities of gel stain and added them to their system. Perhaps Gel stains best quality Is It's forgiving nature, but they won’t hide sanding marks, spots of filler or glue residue. Gel Stain still need a clear topcoat in most circumstances, even if someone tries to tell you otherwise. As with most stains, different brands of gel stains also vary both in their application properties and in their color rendition of the same named stain. However, for those Furniture or wood projects made of blotch-prone woods, such as cherry and pine, gel stains stand tall as a great solution. Their ability to layer color makes them my first choice when I need a high hiding stain. 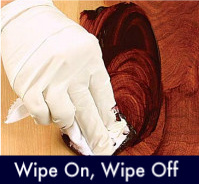 Gel stains have a more opaque quality than most other oil based wiping stains. For this reason, gel stains are also great when used as a glaze. It's easy to see why so many finishers and woodworkers alike have added these versatile stains to their shelves. One of the more alluring characteristics of a gel stain is how easy it can be to apply. You won't need a specialty brush and you won't need the physical attributes of a 25 year old to apply and remove it at lightning speed before it dries and streaks. —only a soft cloth, such and a nicely shaded area without wind . Gel stains are designed to be a wipe on/wipe-off stain. A gel stain is not like a traditional penetrating wood stain that never gets deeper in color no matter how many coats you apply. On the contrary, a gel stain builds up color with each application, so you won't have to apply it heavy on the first application to achieve a darker color. You can always apply the gel stain a second time, covering either all surface areas or only the lighter spots. Gel stain can be feathered in and brushed out to blend In lighter woods, or spot applied even move heavily to hide fillers or flaws. Pine and cherry are notorious for turning blotchy when a stain is applied directly to the raw wood. In a similar fashion, The end grain on most wooded furniture often absorbs stain like a sponge, creating a dark contrast to the rest of the piece. One solution is to use a pre-stain conditioner , or a thin wash coat of clear shellac, or a diluted coat of lacquer sealer, but when using a gel stain you may be able to skip that step entirely. Furniture makers often combine solid wood and veneer in the construction of their furniture. Blending these woods together presents a challenge for anyone who refinishes furniture. Professionals have long employed the technique of tinting their finish to overcome this common obstacle, But the DIY finisher has been on the loosing end of this battle since day one. Gel stains are the ideal solution for this problem. If one section is lighter than another, a second application on the lighter area often evens everything out. Most often, two applications will blend the lighter with the darker woods. It's a good practice to seal in the stain between coats, so that the second coat doesn't soften the first coat. Glazing has long been a staple of finishers as a method used to create depth, contrast and character. Gel stains, with their heavy body formulas and high hiding characteristics, work well in place of more traditional glazing products. Since Gel stains can double as both a stain AND a glaze, it means you can purchase less products. When using Gel stain as a glaze, you can use contrasting colors, or similar colors. Sealing in the first coat of Gel stain is an important step if you intend to follow it up with a second glazing coat. Apply a thin coat of finish over the gel stain and allow it to dry. Sand lightly with 320 grit sandpaper. You are now ready for a glaze" coat. Allow the glaze coat of gel stain to dry before adding another finish coat. As great as gel stains are, they are far from perfect and not the best choice for every job. Gel Stains are fairly opaque and that lack of clarity is a common issue. Gel stain isn't the right choice for many highly figured woods when your goal is to attain a deep rich color that really enhances the wood grain. They are not deep and rich in color like a dye or penetrating stain, and offer up what some would even call a muddy finished look where much of the grain becomes less visible. Gel stains also have a tendency to skin over in the can once opened, something it's oil based wiping stain counterpart doesn't do. This does cause a lot more product waste. 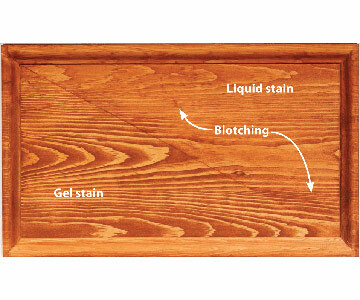 For the most part, gel stains lay on the surface of the wood, rather than penetrating the wood like dye stains do. Coating over the Gel stain and protecting it with a durable finish, especially on heavy use furniture like tabletops is important. If not finished the stain will rub through, most noticeably on the edges. Go slow when topcoating oil-based gel stains with lacquer. Make sure the stain dries thoroughly before finishing. If Gel stains are applied too thick or still curing, the lacquer may crinkle or prematurely chip or crack over time. Gel stains are a great addition to your finishing arsenal. They shouldn't be your only choice, or even your first choice, but they should always be in the mix for consideration.